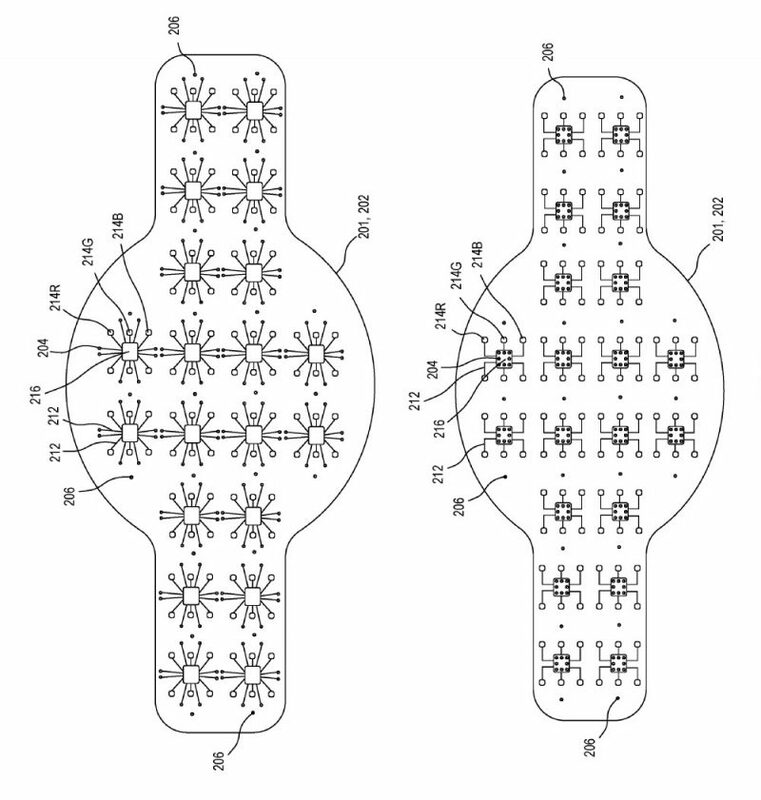 Apple this week was awarded a patent for a potential Apple Watch design featuring a flexible microLED display that integrates with and encompasses almost the entire watch band. 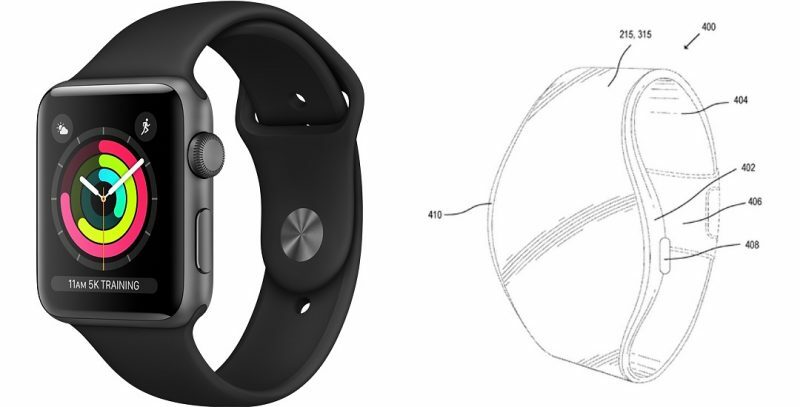 Titled "Display Module and System Applications" and published by the World Intellectual Property Organization, Apple’s patent explores several designs that could one day make it into a future Apple Watch. In the patent, Apple foresees a watch with a flexible display substrate that includes a front side and an underlying second side. An array of microLEDs contact the wiring layer on the front side, while the second side is in communication with multiple electrical driver circuit chips. In one embodiment, a plurality of interconnects extend throughout the substrate and integrate the two layers of the display area, which is surrounded by a bevel width of less than 1mm. The patent also describes a contact ledge area that is wider than the bevelled surface of the display substrate. In this design, the MicroLED and input area of the display substrate extends beyond the watch face and ramifies out into the smartwatch band, transforming the band into an extended display area with touch-sensitive capacity. In a further embodiment, the flexible display substrate includes a first display area for the watch face and a second display area extending to the watch band. In this incarnation, a computer-readable medium receives instructions that dictate the design for both the watch and at least some of the band. Interest in flexible displays has piqued in recent years because they offer several advantages over mobile glass displays, including better durability, lighter weight, and thinner dimensions. For example, Apple’s patent envisions a panel that is rollable or foldable – the type that could be incorporated into a television display and rolled into and out of the housing via a spool. Several Korean and Chinese mobile makers are either preparing to launch or actively developing foldable smartphones for the mass market. Samsung is due to reveal its upcoming Galaxy Fold foldable smartphone this week, while Xiaomi has demoed a similar concept. Apple has been exploring MicroLED displays since at least 2014, when it acquired MicroLED display maker LuxVue. Apple has also been researching flexible OLED displays for a potential foldable iPhone design, and has previously explored wraparound Apple Watch designs using similar materials, although there’s no sign that it intends to bring devices with flexible screens to market anytime soon.